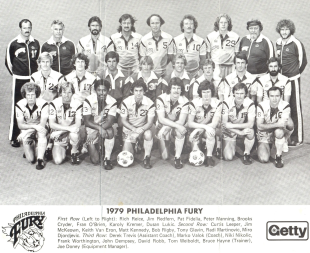 On paper, the Fury looked to be a formidable lot, particularly playing in the NASL’s American Soccer Conference, which in 1978 was made up primarily of expansion teams and also-rans. Unfortunately for Philadelphia, however, the Eastern Division also included the Tampa Bay Rowdies and the Ft. Lauderdale Strikers, two of the better teams in the league. Against this backdrop, the Fury began the 1978 season on April 1, playing against Washington in Veterans Stadium before 18,191 spectators. Unfortunately, the team was thrashed, 3-0. Still, many familiar faces could be seen on the field, including Jim Miller, Bill Straub, and, as a substitute, Derek Trevis. Including Brooks Cryder (who was drafted by the Atoms, but never played for them), the team included four ex-Philadelphia Atoms players. Another problem for the Fury was the fact that Peter Osgood, for all of the hype, turned out to be a complete bust. Purchased for $150,000 from Southampton and touted as a goalscorer, Osgood was actually an aging primadonna with chronic ankle problems. With a $100,000 contract, Osgood did not register a tally until the team’s seventh match, and that remained his only goal through 22 games. He wound up shooting 1-for-57, with most shots sailing over the crossbar so regularly that one would have expected the Eagles to sign him as a kicker. Still, some of the old magic returned in the Fury’s second match, which saw Trevis score a “golden goal” in a 3-2 win over Memphis. As the season progressed, Philadelphia’s big name players started to trickle in. Ball and MacRae debuted in the team’s fifth match, with Ball scoring two goals. By the time Giles arrived in late May, however, the team was mired in the Eastern Division basement with an unimpressive 5-5 record. By June 14, Richard Dinnis, who was a disaster as head coach, had been fired (or quit, depending on who was asked). As it turned out, the man had never played professional soccer, and had exactly five months experience as a head coach at Newcastle—where he had been fired. 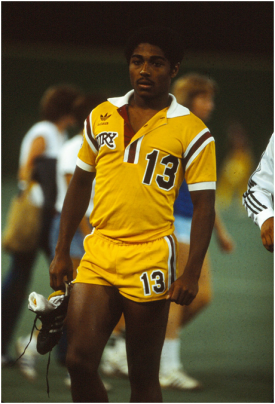 He revealed himself as a man who could not count to “2,” as in the minimum number of North Americans required to be on the field at all times under NASL rules at the time, playing with only 1 for 3½ minutes against Seattle, almost costing the team a forfeit. Pat Fidelia. Photo courtesy of Steve Holroyd. Surprisingly, Dinnis was replaced by Ball. The change did not help much; the Fury simply could not put the ball in the back of the net. One player who did generate some excitement was Pat Fidelia, who led the team in goals with eight, seven of which came as a substitute. Fans also embraced the scrappy play of Fran O’Brien and John Dempsey, two players who would have fit right in with the Atoms’ “No Goal Patrol” of five seasons earlier. Thanks to the NASL’s insane point system of 6 points for a win and one bonus point per goal up to a maximum of 3 per match (for example: if the Cosmos beat the Earthquakes 4-3, the Cosmos would get 9 points, while the ‘Quakes would get 3), the Fury advanced to the playoffs in spite of finishing last place in the American Soccer Conference Eastern Division with a 12-18 record. Philadelphia made a quick exit, however, losing to Detroit 1-0 thanks to a Trevor Francis goal. Never capturing the hearts of Philadelphians the way the Atoms had, the Fury averaged 8,279 per match in their first season. While this figure would compare favorably to the 11,000 per game the Atoms drew in 1973 and 1974, given the NASL’s growth since the Atoms’ debut, the attendance numbers placed the Fury a dismal 18th out of 24 teams. In fairness, it rained on 10 of the Fury’s 15 home dates. Regardless, the club suffered heavy financial losses, in the half-million dollar range. Rick Wakeman and his manager, Brian Lane (who was responsible for the disastrous Osgood and Dinnis moves) bailed as co-owners after the season. Who wants to coach this lot? Entering 1979, the Fury hoped to correct the mistakes of the previous season. To that end, all of the big name stars, except Alan Ball, were released. Ball, however, had no desire to return as a player-coach. Such an arrangement would have been impracticable in any event, since English soccer commitments would again prevent Ball from appearing in a Fury uniform until eight games into the season. Needing a coach, the club initially attempted to go top shelf by signing Cesar Menotti, coach of the 1978 World Cup champion Argentina side, but ultimately bailed on the move because Menotti did not speak English. The language barrier would be “too much of a hindrance,” said Ehlinger. The Fury then turned its attention to Jacek Gmoch, coach of Poland’s 1978 World Cup team. Gmoch had plenty of local ties–he went to the University of Pennsylvania, and had coached the Polish Eagles in the local United Soccer League–and would have been an intriguing choice. In fact, he accepted the job in November 1978, and spent time studying videos of the club’s matches from the previous season. However, Poland’s Minister of Sport refused to release Gmoch from his national team responsibilities until June 1979. At first, the Fury were going to go along with this arrangement, since the recently-retired Derek Trevis would have been a more than capable interim coach. Ultimately, the club deemed that option unacceptable. Since a compromise could not be reached with the Polish soccer federation, the Fury were forced to scramble for a new coach. Only two months before the start of the season, the Fury finally found their man in Marko Valok, former Yugoslavian National Team and Olympic coach, and he was hired on February 16, 1979. While trying to find a coach, the team also set about upgrading its roster. The young core of the team, including Brooks Cryder, 1978 team MVP Fran O’Brien, Rich Reice, Tony Glavin and super-sub Pat Fidelia, all returned (although O’Brien did not until after a bitter holdout), as did veteran stalwarts Ball and John Dempsey. Bill Straub retired, however, as he was unable to take time away from his family’s jewelry business, and Trevis became a full-time assistant coach. Although attempts to acquire attacking midfielder Bruce Rioch from Derby County, and defender Chris Catlin from Brighton, fell through, the Fury had better luck within the league, picking up solid goalkeeper Keith Van Eron from Houston and goal scoring maven David Robb from Tampa Bay. The 1979 season started with a cloud of labor strife hanging over the NASL, as the players’ union threatened to strike for recognition. For its part, the Fury cut backup goalkeeper Dave Bragg just before the season—on the same day the player rep was meeting with the union in Chicago. “I didn’t even know they were meeting that day,” said Ehlinger, unconvincingly. The Temple grad went quietly. Also gone was Osgood, sold to Chelsea for a fraction of what he had cost, and Johnny Giles, who opted not to return on loan. With less than two months to prepare, it was not surprising to find that Valok had difficulty getting his team ready for the 1979 season. It is also not surprising that, needing to beef up his roster, he acquired four countrymen: a pair of 29-year old Olympic veterans, holding midfielder Radi Martinovic and left back Miro Djordjevic, and NASL veterans Stojan Nikolic and Dusan Lukic. After an unconvincing 1-3 preseason, the club dropped its season opener in Memphis, but opened its home slate with a 3-0 thrashing of Rochester, with Fury fans treated to a Robb hat-trick. Unfortunately, and ominously, there were only 6,152 spectators on hand to see it that day. Among the players missed out on by the Fury as a result of absentee-ownership-by-committee were Petar Baralic of Belgrade Red Star (who ultimately signed with Tampa Bay) and German legend Gerd Muller, who wound up in Ft. Lauderdale. Ehlinger also complained that the owners were making little attempt to market the team. One attempt was simply embarrassing, an ad featuring an old-time prospector who described that Fury as “the roughest, the toughest, the meanest team in town.” Not exactly a harbinger of good soccer. “Deal a Day” Lane, Wakeman calls him on several occasions in his writing. Fun stuff. The ad about the “roughest, toughest, meanest team in town” seems in line with a lot of the NASL’s marketing, which sought to promote soccer as a bashing, crashing manly sport. Thus team names like the San Diego Sockers and the Oakland Stompers. These are great articles, Steve. You’re getting into 1979, which is the season when I really enjoyed the Fury, especially Dusan Lukic. I think the Stompers name came from the grape/wine industry though. Thanks Roger–and, speaking of bad marketing, let’s not forget how the new Seattle Sounders ownership in 1983 managed to run off fans with the great tag line (featuring on their media guide cover, no less) “Sounders Soccer–Red, White, Black and Blue.” The Sounders folded after the season.